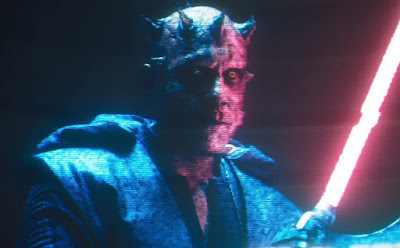 Perhaps the biggest surprise at the end of last year's Solo: A Star Wars Story was the return of Darth Maul to the big screen at the end. The scene featured Ray Park reprising his role as the physical presence of Maul from The Phantom Menace, along with the voice of Sam Witwer who voiced Maul on the animated series' Star Wars: The Clone Wars and Star Wars Rebels (where Maul's resurrection and ultimate fate were first revealed). However, Witwer voicing the character wasn't always the plan for the film. You can't help but feel bad for Serafinowcz, thinking he was going to be in Star Wars again only to find out he had been replaced. That said, he does seem to have a good attitude about it (which is more than can be said about his attitude about the prequels). Maul's return was a big surprise for several reasons, not the least of which being that he seemingly died at the end of The Phantom Menace. However, the animated series Star Wars: The Clone Wars revealed that he survived and sought to establish himself in the galaxy once more by amassing power in the criminal underworld. Maul would also later appear in the subsequent animated series Star Wars Rebels, which takes place chronologically after the events of Solo. The decision to include Maul in Solo, came relatively late in the game. The filmmakers considered multiple options for characters that Qi'Ra (Emilia Clarke) could call after killing her boss, Dryden Vos (Paul Bettany). It was co-screenwriter Jon Kasdan who first pushed for the idea, however it was kept out of the script until the decision was finalized. At which point Park and, apparently, both Serafinowicz and Witwer were contacted to make the scene happen.